A few grape growers in California will make use of a new high-tech system this year that monitors micro-climates in their vineyards. By following the systems’ electronic directions they hope to increase the quality and quantity of the grapes they produce and the wine that comes from them. 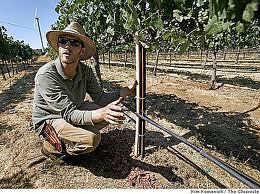 Tiny sensors that can be imbedded in selected vines are the eyes and ears of the system. The monitors, called motes, relay data about temperature, moisture, atmospheric pressure, airborne particles and more to a central receiver for analysis. Although the system is new and expensive at about $150 per acre, it has been employed for the past two or three years by at least two of the state’s major wine grape producers. Representatives of both have praised the systems’ gathering of information they have not had access to previously.